businessgateways joins the Omani delegation to the 50th Offshore Technology Conference May 6-9, 2019 in Houston, Texas. businessgateways is part of the Omani delegation, led by US Embassy’s Deputy Chief of Mission. The delegation includes representatives from the Omani Ministry of Oil & Gas. businessgateways is participating in the panel discussion about Oman’s Energy Opportunities in Houston with the Bilateral Chamber of Commerce, hosted by US Embassy, Oman. JSRS Suppliers based in the US and other international JSRS Suppliers visiting OTC, Houston, can meet the JSRS team for support and clarifications. The Offshore Technology Conference (OTC) is where energy professionals meet to exchange ideas and opinions to advance scientific and technical knowledge for offshore resources. OTC gives access to leading-edge technical information, the industry’s largest equipment exhibition, and valuable new professional contacts from around the world. Its large international participation provides excellent opportunities for global sharing of technology, expertise, products, and best practices. JSRS Buyers (O&G Industry and other industries) utilize JSRS Certified Companies for their procurement activities. 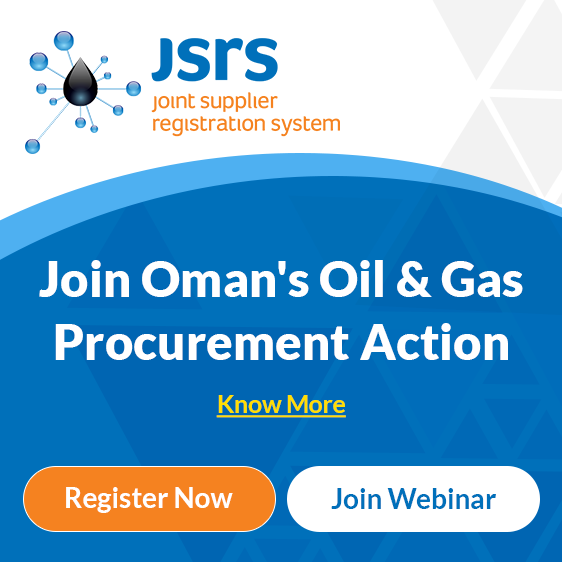 JSRS is an initiative by the Ministry of Oil & Gas, Oman. The JSRS Certificate is a Mandatory Requirement for any supplier wanting to work in Oman’s Oil & Gas Industry.